Fat body and strong power is feature of Animatronic Dinosaur Triceratops. Its named Jurassic Tank from praise of experts of Dinosaur. The Animatronic Dinosaur exhibited in Poland's jurassic forest, which protected by local department. Our Animatronic Dinosaur moulder said that the dinosaur look like sick when making the Animatronic Dinosaur. The colorful Animatronic Dinosaur Rex mainly used for local Animatronic Dinosaur Exhibition. 6m long Animatronic Dinosaur Exhibit (Amargasaurus Replica) show in jurassic park of Poland. Because its sand on the park playground, we don't make the Animatronic Dinosaur sponge. Normally, we have present 15 Animatronic Dinosaur for Sale in the factory. If no purchase plan, will enter into tour exhibition of Dinosaur Alive in the end of year. Picture shows 22m long Life Size Animatronic Mamenchisaurus. In the indoor of Dinosaurs Alive Exhibition, Animated Animatronic Allosaurus performed its excellence to visitors. 2 Allosaurus seemingly stared at the their prey seem like visitors and wanted to launch attack. They made people feared. Animatronic Dinosaur Spinosaurus came to the Funta Dinosaur Park in Croatia. 6m Spinosaurus model with scary appearance scared the visitors. When visitors approached it, would react with roaring. 3m long Animatronic Dinosaur Carnotaurus model made in professional animatronic factory. Red color on its skin look like a hungry predator, who is searching its food. The little Carnotaurus only cost 5 days to be completed. 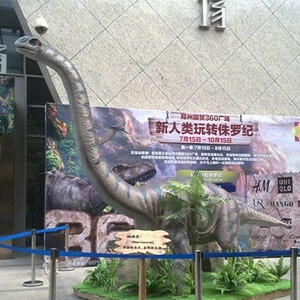 In the August 2011, one long 8m Customization Animatronic Omeisaurus showed in the 360 plaza Zhengzhou. Basically, green dinosaur color exchanged blue, which is represented color of its 360 business mall. 12m long Animatronic Dinosaur Brachiosaurus show in the pawn of Dominican Jurassic Park. In the early 2012, Fedal who was the director of the park came to our Dinosaur Factory for purchasing. The 12m Brachiosaurus was favour to him. The 3m long Animatronic Stygimoloch is exhibited showroom. After our Australian client visited our factory, he bought the animatronic dinosaur. The picture comes from his showroom. This is 6m long Animatronic Irritator. It is exhibited at National Forest Park, Zhangjiajie, China. The lifelike dinosaur attractions is surprised to local tourists. As park attractions, the animatronic dinosaur pleases people well.